you today...I hope that you feel blessed, too. holds the blessings and other Irish-inspired items. paper aged with coffee grounds or scrapbook paper. and re-outfitted with shamrocks for St. Patrick's Day. charmed race of people who are quite lucky. prices I got them for but finally the price tags had to come off. see that trial and error process click Easy Soldered-Bottle Look. you today watching over you. I really enjoyed so much lovely green here. Have a great St. Patty's and a wonderful week. All of your St Patrick's posts are so lovely! I'm feeling very blessed just by reading your poetry! You are certainly on a "ROLL" with your wonderful Irish day posts! Look forward to the next holiday cause you are so inspiring! And a Happy St. Patrick's Day to you, too! I'm lovin those clover tops. What a super clever way to create a charming detail. 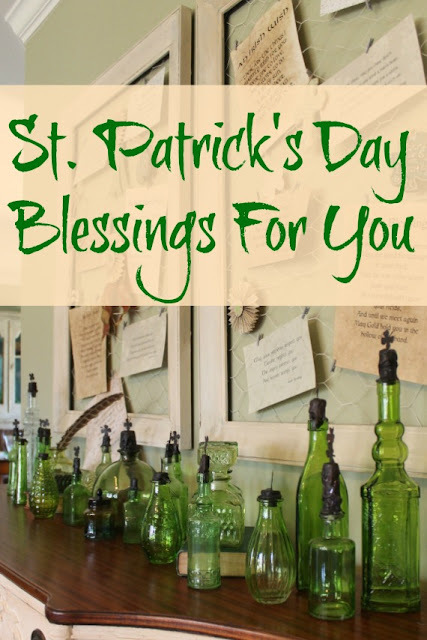 Your St. Pat's vignette is so neat. Love the blessings and vintage touches to the chicken wire bulletin boards...and OMGosh, how long have you been collecting green bottles? They really make a great statement! Happy St. Patrick's Day! Where can I get the saying about the length of the kilt???? ?